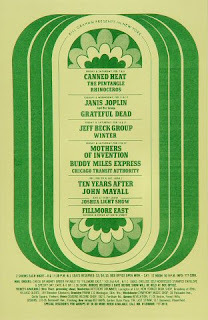 Today in the "rock room" a first generation audience recording made at the Fillmore East on February 7, 1969 featuring "Canned Heat" is playing loud and proud. 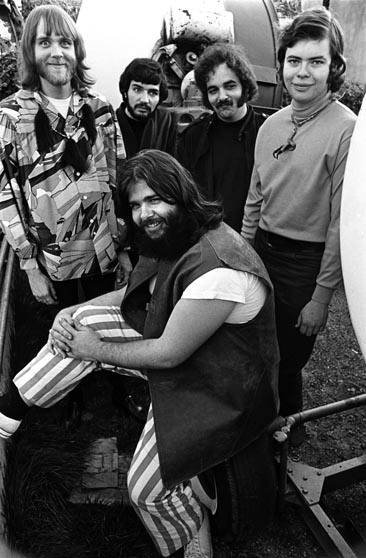 The field recording, while having some sonic issues is one of only a few surviving documents to feature the "original" and definitive "Canned Heat" line up. While the vocals are somewhat distorted at times, and there are many speed issues, this recording is a lucky capture of a unique and provocative performance of the "Heat" at their peak. The show spotlights a raucous New York crowd, and some amusing banter from the folks near the tapers setup. This is a recording that "puts you there" as long as you have the musical patience to wade through the sonic anomalies and dig the tunes. 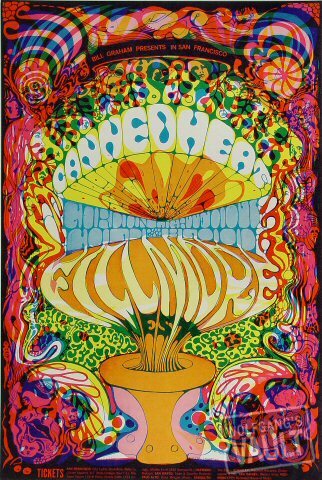 "Canned Heat" along with the "Butterfield Blues Band" are one of the original and most adept "white boy" interpreters of the blues. This performance is solid documentation of the group exposing and spreading their love for the genre as well as its effect on their own originals. Their adept stew of psychedelia and country blues gathered them fans of all types, as there was not a band quite like them. The recording fittingly opens with the scream of a female fan, and the band slinking into "Aint That Loving You Baby" a Jimmy Reed cover. "Aint' That Loving You Baby" shuffles confidently out of the speakeasy and into the dark New York streets on Al "Blind Owl" Wilson's slinky harp blasts. Vestine takes the first guitar solo break taking three rounds. The first solo brings to mind a dark dusty, dilapidated wooden floored shack on the back roads of Mississippi, suddenly electrified by neon lights and amplified guitars. Voted one of the top 100 guitarists of all time "Sunflower" Vestine deconstructs the classic blues into something bigger and more virtuosic. After the second soulful but rudimentary slide solo by Alan Wilson, the band drops out so Larry "The Mole" Taylor can take his first of three fine bass solos over the course of the evening. As the bass solo ends the band slides like a whiskey across a wooden bar into a stomping harmonica shuffle which leads into Vestine's climactic and dynamic concluding solo. Vestine has been recognized posthumously as one of Rolling stone's top one hundred guitarists off all time; while this is a great honor, I assert that his talents and abilities on his ax have been too undervalued for too long. This recording spotlights his incredible dexterity and feeling on the instrument. After a short introduction, "Bullfrog Blues" a Canned Heat original hops out of the swamp and settles on the stage. The taper exclaims "ribbit ribbit" as the Heat begin their honky tonk swamp stomp through the reeds. One thing that catches my attention is the volume of the band at this point is extreme! Taylor's bass when played high up the neck reaches a "groovy test tone" status ringing through out the Fillmore. Vestine again blows the crowd's hair back throughout the venue with his up front and inimitable blues riffing. The band chugs like a locomotive slightly out of control smoking down the track. 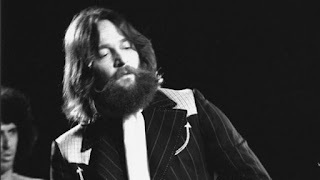 The crisp chiming rhythm guitar of Wilson loans the song the "classic" Canned Heat boogie instantly recognizable on their hits such as "On the Road Again". Unfortunately Bob "Bear" Hites vocals are somewhat obscured by the crowd and volume of the band on these first numbers, but that changes with what I feel is one of the highlights of the recording coming next. 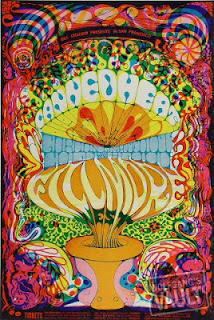 Both Hite and Wilson's inspiration for creating Canned Heat was found in their record collecting addiction, which coincided with their love for updating and disseminating classic blues works and lost masterpieces. Nowhere on this recording is this expressed more conclusively than in the version of "Sugar Mama" respectively dedicated to Sonny Boy Williamson. "Sugar Mama" is a country blues containing only Taylor's bass, Wilson's harp, and "Bear's" impassioned vocals. I feel as I'm sitting on a hazy, dusty back porch somewhere in the Delta, sharing a whiskey, and observing the seasoned street musicians soulfully expressing their art in the thick mossy air. "Sugar Mama" takes its time, and even though only containing two instruments and a voice, sounds orchestrated, and swings like a cickle in a sharecroppers hand. Wilson's dirty and breathy harp blasts cradle the haunted melody of the song against the bass line like a mothers child. Wilson grinds the harmonica to dust with his impassioned and respectful playing. Hite's off mic shouts of "Oh my God" and his bluesy growls express the pure soul and emotion the band is charged with when paying respect to their heroes and inspirations. This is a deep blues, and one of the most intense interpretations of a blues done by a 1960's revival group. After announcing that Wilson's amp has been blown, the Heat slink into Howlin Wolf's "Killing Floor" with a jumpy double guitar figure that has to encourage hip swinging. Until now the sound of this recording has been solid and enjoyable with minimal clicks and warbles. Unfortunately the recording starts to show some speed issues and some anomalies at this point in the show. "Killing Floor" suffers from some of these problems, and they somewhat hamper a smoking performance. Highlights are a slippery Wilson slide solo, and expressive Vestine guitar work. "On the Road Again" follows and it contains an extended jam that rises and dips like a bluesy roller coaster ride for the assembled crowd. I find myself wishing for a soundboard recording at this point, because the jam is so good, I'm sure more detail and band interplay would reveal itself with a crisp version. "On the Road Again" becomes a fuzzy stomp through the flower garden with the songs tell tale buzzing drone audible on the tape. Train like harp blasts signal the guitar "freak out" that finally reaches a stuttering fire breathing climax and strides back into the central boogie riff under the cover of night. The "Heat" is rising steadily through out this jam, and if not for some sound issues it would be a definitive glimpse of the original Canned Heat line up. Banter by the tapers can be picked up after the songs ends, and is often as enjoyable as the performance. A woman can be heard shouting "Boogie! Boogie! ", and a man near by can be heard exclaiming, "It's only 10:30"! Another voice, or the same guy, can be heard remarking "how loud" the band is! This is the reason pirate and bootleg recordings are such a valuable addition to any band's catalog. These are the goods that "rock geeks" pine for, and are fortunate to be able to enjoy. The audience recording and I believe the performance ends with a twenty plus minute jam on "The Boogie", which I assume is the encore. Again, patience and a discerning ear is needed as the speed issues again rear their ugly head. But cutting though the sonic problems is again a conclusive and special jam. A delicate Alan Wilson slide guitar introduction ushers in the groove that bands such as ZZ Top would soon make a career out of. After jamming on the groove for a bit with a shout from the crowd of "Don't stop now!" "The Mole" steps forward for his third bass spotlight of the evening, and the most aggressive of them all. The bass solo thumps and then melts back into the boogie march among a stop and start synopated wash of sound. Eventually this bass interlude segues into a guitar segment for Vestine who sprays the crowd with transcendent speed induced riffing. Sounding in my opinion very "Allman" like, you can get an idea of the kind of guitar work being layed down by "Sunflower". Slinky, ethnically tinged, but pure blues Vestine steals the moment. Each band member receives a focused spotlight segment to express their talents throughout "The Boogie". Biting at the heels of Vestine's guitar feature comes Adolfo de la Parra's rhythmic and enticing percussion spotlight. The drum solo receives intense applause, with scattered shouts and screams. Adolfo's mastery of numerous rhythmic tinctures is evident as he illustrates a plethora of grooves. The band follows Adolfo's blazed path back into the framework of the song, and bring the twenty minute blues boogie to a crashing conclusion. The final two extended tracks on this recording are essential for any fan of Canned Heat or the blues, we can only hope that somewhere there exists a beautiful sonic document of nights like this one for our enjoyment. Until then its treasures like this recording that keep musical moments frozen in time for future music fans to enjoy. If you are ready, willing, and able to wade through the sound issues and tune into this performance there are numerous magical and consciousness expanding moments waiting to be discovered. 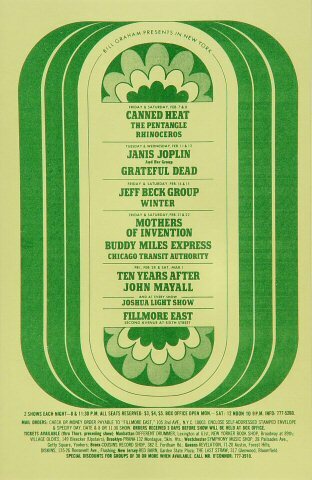 I am sure that Canned Heat would be even more recognized than they already are if more evenings like this were readily available for listeners, and in great quality. If you are already familiar with the Woodstock and Monterey performances by the band and are looking for more, this recording is a great place to start. Let yourself sink knee deep in the blues and see how bands such as the Heat were and are still responsible for bringing the now recognized blues giants into the public vision. By studying and spreading the gospel of the blues through their own interpretations, Canned Heat made not only a name for themselves, but made many of their unrecognized blues idols household names as well. where do i get this bootleg? There are a few places of interest online that have it available. If you trade by snail mail let me know.